110-year-old Kriegshaber House being renovated for rebirth as a brew pub. On a recent chilly afternoon, Bob Sandage wrestled with a pressure washing hose, blasting years of graffiti and grime off the walls and pillars of one of Atlanta’s once stately mansions. If all goes as planned, he soon will realize both his dream of operating his own brew pub and saving one of the city’s historic treasures — In-man Park’s 110-year-old Kriegshaber House, also known as the Wrecking Bar. Sandage has an ambitious goal to open the Wrecking Bar Brew Pub by April and have its second floor ready to rent out for weddings or parties by November. “We have lots of work to do before then, but I think we’ll make it,” he said. He and his wife, Kristine, are spending about $2 million on the project (including the property), which is lauded by many for not only cleaning up an eyesore, but for preserving a piece of old Atlanta. “You wouldn’t have believed this place when we first got it,” Sandage said of the house, located at 292 Moreland Ave. “It was covered inside and out with graffiti. Vagrants were living in it, setting fires. Trash was everywhere.” The home was built for Victor Hugo Kriegshaber in 1900. He was a businessman and philanthropist who created the city’s first public playgrounds and helped establish the Atlanta Philharmonic Society. It was designed by the famed architect Willis F. Denny II, known for designing the Rhodes Memorial Hall, St. Mark Methodist Church and other Atlanta landmark buildings. “Our history has been slipping away,” said Mark C. McDonald, president of the Georgia Trust for Historic Preservation. 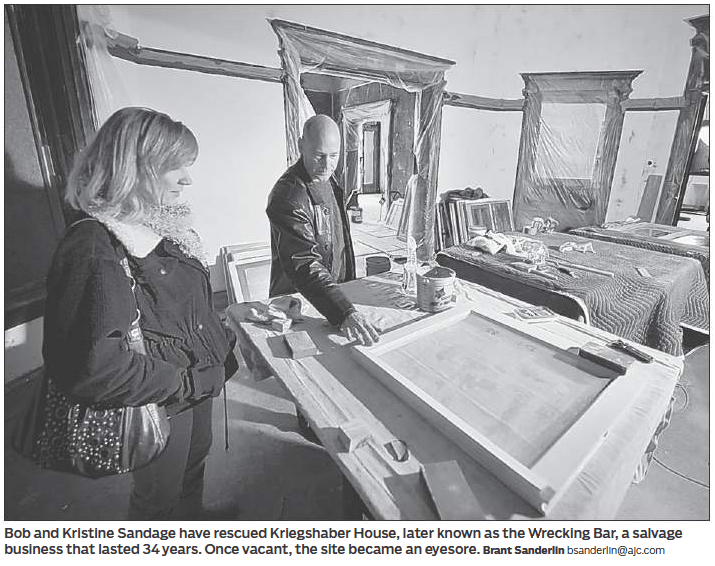 The Kriegshaber House “was vacant for five years, and I believe it was in peril,” McDonald said. The home, about 18,000 square feet, has six fireplaces, mahogany carved mantels, terra cotta flashings. It also had some lavish stained-glass windows added in the 1930s when it was briefly used as a church. The glass is being restored. Many Atlantans will remember the dome-topped house as the Wrecking Bar, an architectural salvage and antique business owned and run for about 34 years by Wilma Stone. She sold it in 2004 to Inman Park Properties for an undisclosed amount. Sandage, who sold his engineering company a few years ago, has had his eye on the house for a number of years, but he said the development company wanted too much money. “I love old houses. I love a challenge. But we just couldn’t get the numbers to work,” he said. He bided his time and bought the house when it went into foreclosure more than a year ago. He began working in earnest on the project in March 2010, with a 10-person construction crew. “This project will definitely help us rejuvenate the Moreland Avenue corridor,” said City Council member Kwanza Hall, whose district includes Inman Park and Little Five Points. “It’s going to be an upscale destination right where we need it, and that could spur more development in the area,” Hall said. Hall said that the city had to pass several variances to the city’s ordinances to allow alcohol sales at the location, and he said that they were careful to work with the residents. Regina Brewer, president of the Inman Park Neighborhood Association, said that, even though the property was on the National Historic Register, residents were unsure if anyone would save it. Brewer said that, at first, some people in the neighborhood were concerned when they heard it was going to be a pub and a 110-seat restaurant. “But Bob [Sandage] worked very closely with us, and I think everyone is pleased,” she said. Sandage knows that the restaurant business is tough, even in the best of economies. But he said he thinks he has a winning plan. This entry was posted in Bars, Inman Park. Bookmark the permalink.